Advocates target Trump in DACA push ahead of March 5 - Integration Through Media ....! By Tal Kopan, Washington (CNN): Immigration advocates are unveiling a fresh advocacy campaign on the Deferred Action for Childhood Arrivals program aimed directly at President Donald Trump — even as a March 5 deadline has been rendered toothless and Congress is retreating from action. The campaign is designed to get the President’s attention, using a mix of digital geo-targeting and physical presence. The ACLU’s national political director, Faiz Shakir, described the theory behind the effort as getting the issue in front of Trump and sending the message that he uniquely can reach a solution if he commits to it. As of Sunday, the ACLU campaign will be on TV screens, in DC cabs, local political newspapers and other outlets, and streaming apps. The civil liberties group also plans to buy ads on “Fox and Friends,” a show the President regularly watches, and Twitter ads designed to help supporters tweet directly at Trump and get into his Twitter feed, another presidential favorite. The group will also debut a banner with Trump’s face and a countdown clock to March 5 in front of the White House on Sunday, as well as work to have demonstrators in California when Trump travels to San Diego, perhaps later this month, to see his border wall prototypes. The campaign demonstrates the long odds of achieving action on DACA in Washington, as well as the loss of meaning for the March 5 deadline. 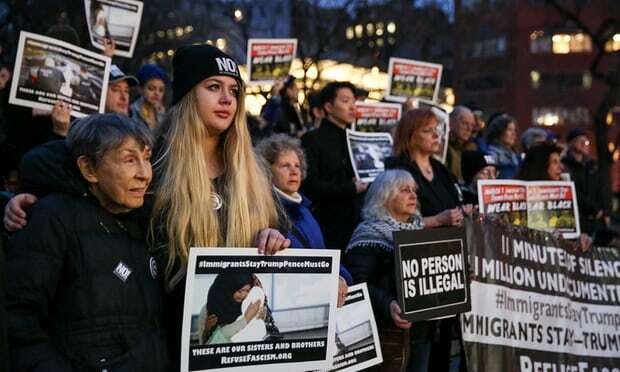 When Trump opted to terminate the program, which protects from deportation young undocumented immigrants who came to the US as children, he planned for the permits to begin expiring after March 5, giving Congress six months to act to make the program permanent. Shakir said the ACLU plans to continue the push in the coming weeks and into November’s elections, urging action however it can send the message.